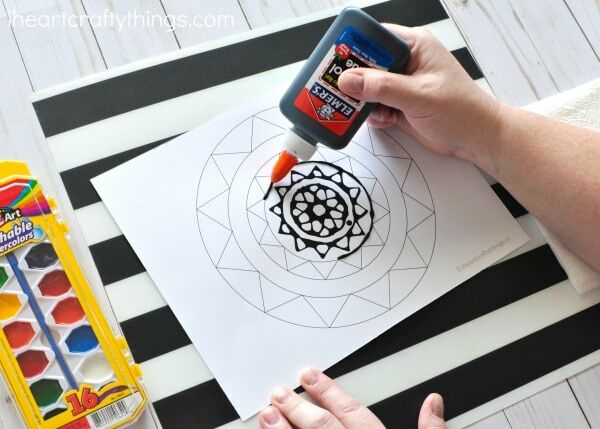 We have partnered together with Walmart today to bring you this beautiful black glue mandala art project and to get you excited about back-to-school shopping. I was compensated for this post and all opinions expressed are my own. I always get extra giddy about back-to-school shopping because it’s a great excuse for me to stock up on supplies for us to use for crafts throughout the school year. 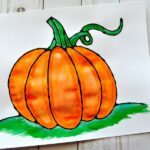 School glue and glue sticks are always on the top of my list along with construction paper, watercolors and markers. We’ve already crossed most of these items off our list since back-to-school supplies are in stock and available at Walmart right now. 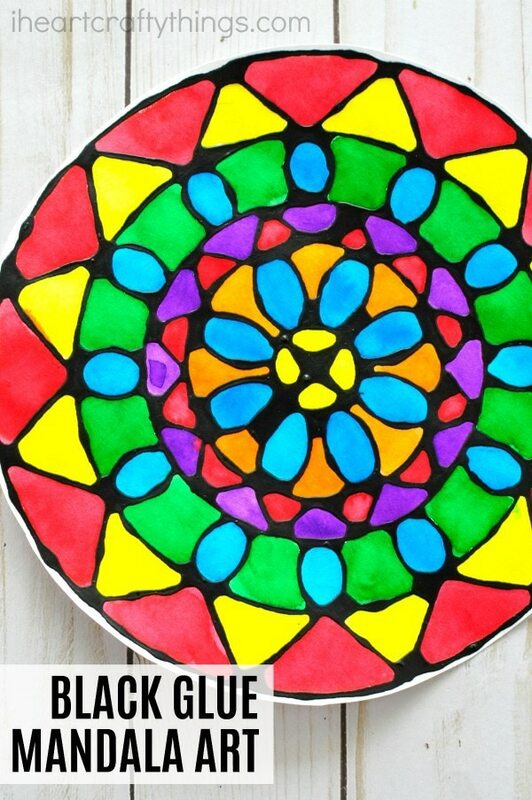 Last week we had fun using some of our new glue stash in a creative way by making this colorful black glue mandala art project. Some may not get as excited about buying back to school supplies like I do but that’s what makes Walmart a perfect shopping destination since they offer several different ways to shop. If you prefer to do your shopping from the comfort of your home you’ll love their online grocery pickup. They have hundreds of back-to-school staples online so you can gear up for school at the same time you stock your fridge and have it all delivered right to your car. They have also doubled the number of items available for same-day pickup. Did you know Walmart is now integrating the popular resource, TeacherList, into a dedicated back-to-school shopping destination? This means you can get your school supply list directly from your students teacher, taking all the guesswork out of deciding what supplies to purchase. Just remember to stock up with extras of your favorite supplies so you can make fun art projects like our black glue mandala art. All you need to do is print out our mandala template, create the black glue mixture and you are set for an afternoon full of fun! mandala template <—-Get the mandala template here. 1. 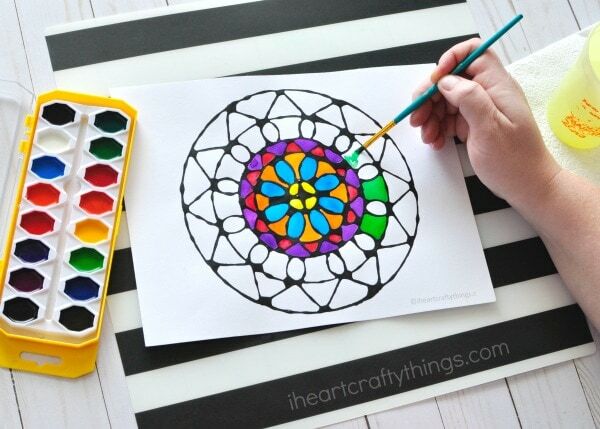 Print out one of the mandala templates on your mixed media paper and gather your supplies. For your convenience we’ve created two different mandala patterns and have a blank version available to help you design your own. 2. Mix together your black glue. To do this, use a bottle of Elmer’s School Glue that is about 75% full. Open the lid and squeeze in a generous amount of black acrylic paint. Put the lid back onto the school glue and then shake, shake, shake the bottle of glue for several minutes to incorporate as much of the black paint as possible. Then remove the glue lid and give the mixture a stir with your skewer or stick. The end of a paintbrush works well for mixing too. 3. Before you begin tracing the template, test out the glue first on a napkin or separate piece of paper. Create some lines to experiment with the flow and spread of glue. Once you’re happy with the way the black glue flows use a steady hand to trace the lines of the mandala template. 4. Leave the black glue to dry overnight. This step is important because if you paint your picture prior to the black glue drying your watercolors will mix with the black paint. 5. 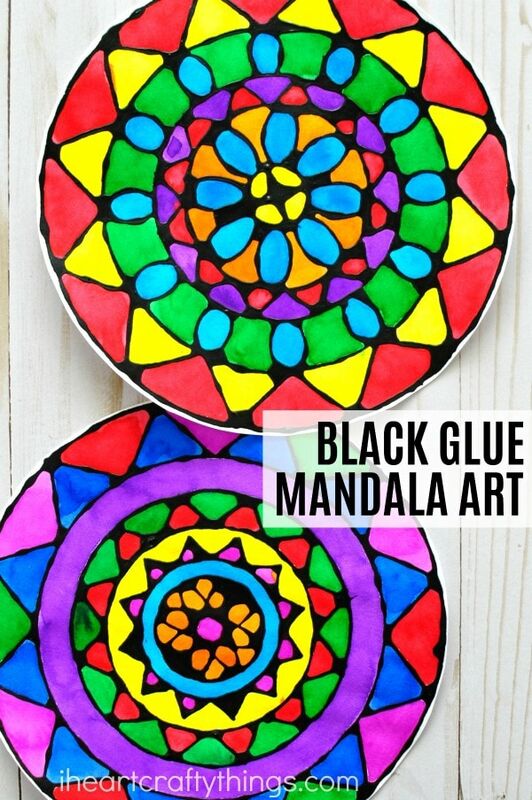 Once the black glue is completely dry, paint your black glue mandala art project with your watercolors. Allow the art project to dry completely. Your black glue mandala art project is finished! 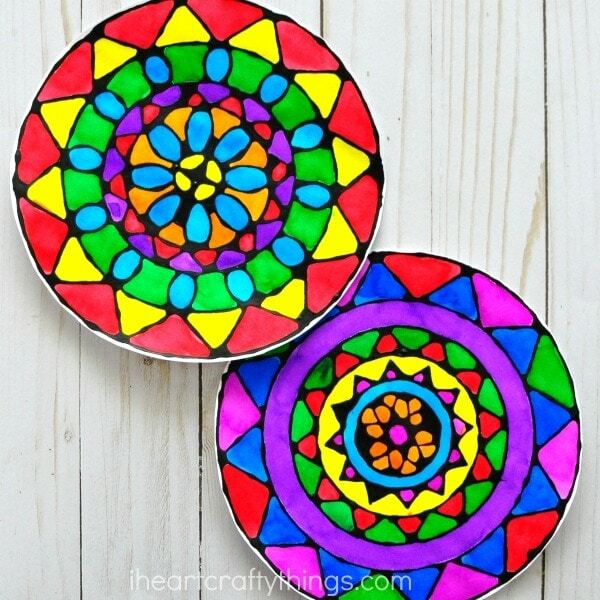 Cut out your mandala art project and display it somewhere in your home for everyone to admire. 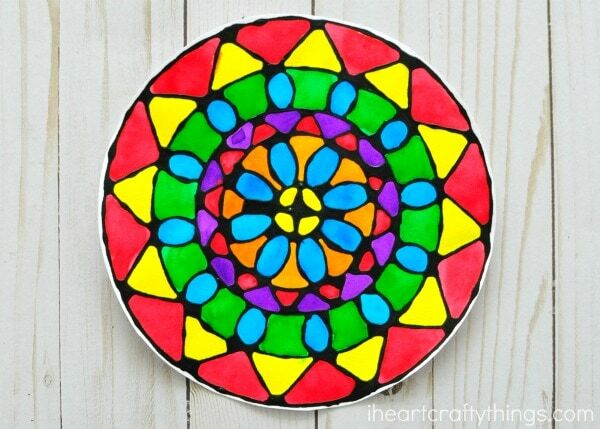 The beautiful mandala pattern and bright colors reminds me of stained glass. Isn’t it gorgeous?! 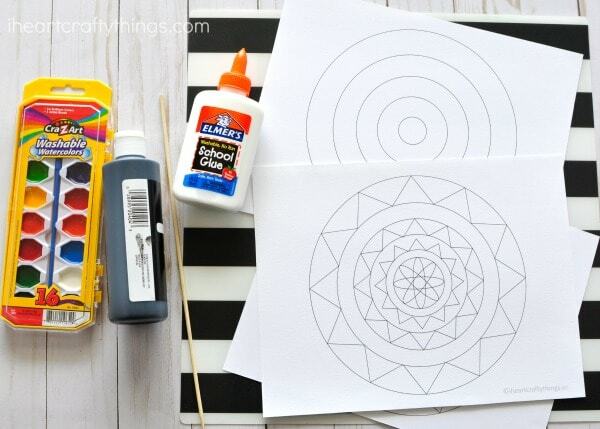 Did our black glue mandala art project get you excited to go out and do some back-to-school shopping at Walmart? Be on the look out for “Back-to-School Helpers” at your local Walmart near checkout who will be there to assist customers, help to shorten those waiting lines and grab those last minute items you forgot. 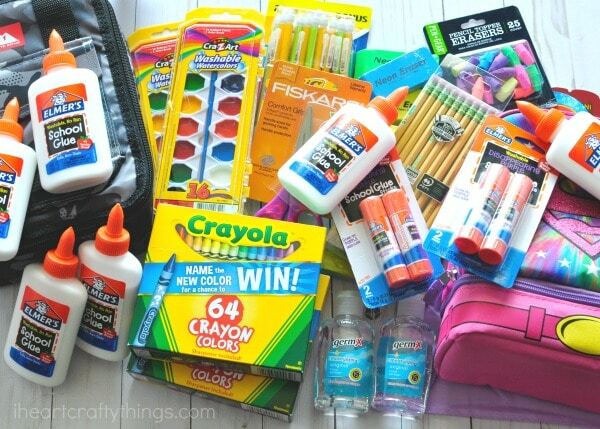 What supplies are at the top of your back-to-school shopping list? 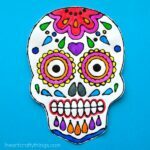 Want more gorgeous black glue art ideas? You’ll love these beautiful black glue butterflies and this colorful black glue hot air balloon craft. We also have a black glue cactus craft, perfect for summer. 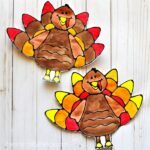 I love it crafts, I am teacher clients deaf da Bona Terra in Austin.